As Egypt's Jails Fill, Growing Fears Of A Rise In Radicalization : Parallels Unprecedented numbers of political prisoners in Egypt's jails could lead to a supersized version of an old problem: inmates becoming radicalized. "In jail, they become ISIS," says a former prisoner. Supporters of Egypt's ousted President Mohammed Morsi, a Muslim Brotherhood leader, chant slogans against the Egyptian military during a trial in which they were charged with violence in Alexandria, Egypt, on March 29, 2014. Thousands of Muslim Brotherhood supporters have been jailed by the current government. A former prisoner tells NPR he saw some turn to ISIS in prison. In the name of fighting terrorism, authorities in Egypt are jailing people for offenses as small as a Facebook post or being at a protest. In the case of Hossam el-Deen, it was being in the wrong place at the wrong time — when security forces came to arrest a neighbor. "There is just one accusation for me, that I am related to a terrorist group, this is the only accusation that I have," he says. "Without any evidence, without any proper action, without anything." Deen, a 47-year-old father and freelance journalist who runs a consulting business, spent five months in a maximum security prison. He was never charged and was finally released in March. What he saw inside scared him: young men, many who hadn't committed crimes, became hardened radicals over the course of their confinement. 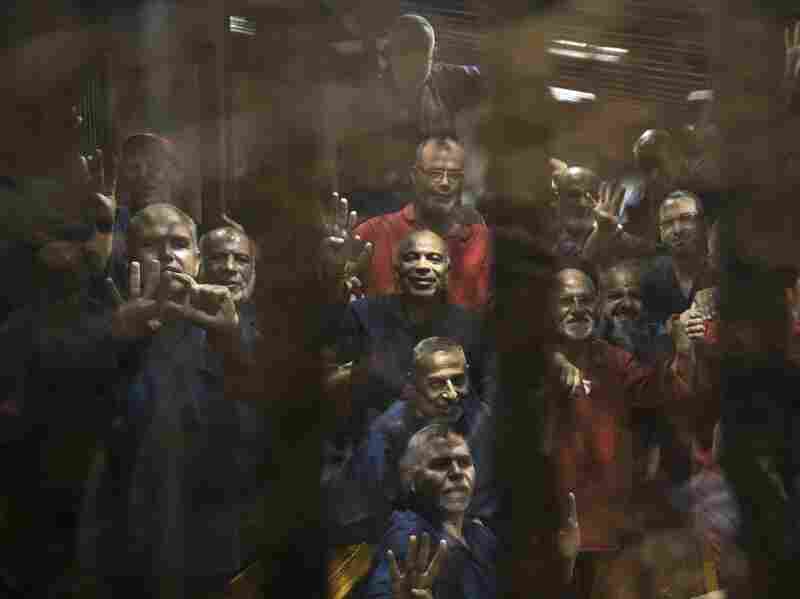 Egyptian Muslim Brotherhood defendants stand behind bars in Cairo last year during their trial, along with Mohammed Morsi, the former president who was ousted in 2013. Egypt's jails historically have bred militancy. "In jail, they become ISIS," he says. "And this is very horrible. Many people — not one or two or three, many." 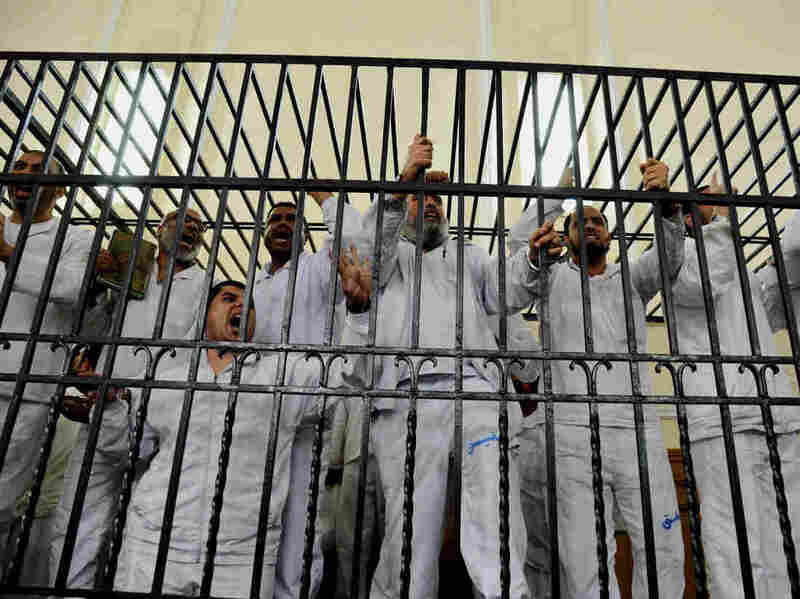 Egypt has a history of breeding militancy in its jails. Prominent jihadists including al-Qaida leader Ayman al-Zawahiri were radicalized during their abuse and humiliation in prison. Now it appears to be continuing, possibly on a wider scale to match a broad crackdown on rights in Egypt. Many of those whom Deen knew in jail were supporters of the Muslim Brotherhood, a party forced out of power in a coup and then outlawed. They were imprisoned by the thousands. "And I saw even members of Muslim [Brotherhood] become ISIS now," Deen says. "Some of them spent three years now without any real accusation in this very hard condition — so they become thinking that violence is the solution." Deen says he's terrified that the tougher Egypt's security measures become, the more people will resort to violence. He rejects that option for himself, but he's seen impressionable prisoners turn to it in jail. "No one give us solution, no one give us a way to get our rights and to live in peace in this country," he says. "We don't see till now a light in the end of the tunnel." I made contact with a man in his mid-20s, who's still in the maximum-security prison where Deen was held. He asked me not to reveal his name or how we communicated, out of fear for his safety. He was sentenced to more than two decades by a military court on charges that include belonging to a banned group and possessing firearms and explosives. He says there was no evidence against him, save a false confession extracted under torture. Human rights groups corroborate the young man's claims. Today he sleeps on the floor, with no mattress, in a cell with 10 other people. He told me that ISIS members imprisoned with him try to recruit him frequently. He says there are more than 100 ISIS members inside, and they openly sing Islamic State chants together at night. They bring him food. They talk to him about his father, who was killed in 2013 along with nearly 1,000 others, when the government crushed two sit-ins in Cairo. They tell him he should take revenge. When he refuses, he says, they threaten him and call him an unbeliever. He's afraid of them. "I'm stuck in a circle," he says. "The Egyptian government from one side and ISIS on the other." Vulnerable prisoners like this man worry analysts watching the region. "The current regime will be producing the next wave of major political violence and terrorism in Egypt," says Omar Ashour, at the Institute of Arab and Islamic Studies at the University of Exeter. Ashour says that's happening in large part because of the unprecedented level of mistreatment in Egypt's prisons. Now, he says, abuse in Egypt's prisons is as bad if not worse than at any other time in Egypt's modern history. Unless there's reform to stop prison abuse and wrongful convictions, he warns, Egypt's prison will continue to be fertile ground for armed groups to find recruits.